So popular for Hollywood Sweet Sixteens and Quinceaneras, our delightful clapboard place card holders will make everyone a star! Your guests will love taking them home to display a photo or memo - a wonderful keepsake from your celebration. Also very popular as Hollywood Bat Mitzvah place card holders, ours measure 4 1/2" x 1 1/2" and features a poly resin base with a wire cardholder extending from its top. 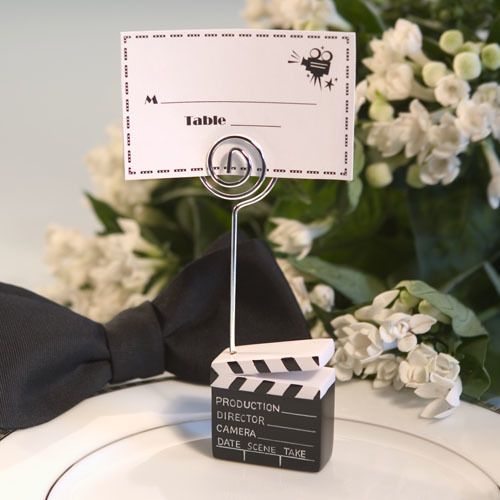 Movie themed place cards included! Holders arrive in individually packed in clear bags. Please allow up to 5 business days to fulfill your order; then add ship time.